US gross domestic product (GDP) growth should be higher than in 2016, reflecting a tighter labor market. However, this almost-full employment is far from ideal—a serious skill divide exists alongside too many temporary and underemployed workers. The resulting low productivity growth could lead to a plateau as the year progresses. Consumer spending will likely grow and the ratio of consumer savings to disposable income should remain flat. Consumer confidence should also remain high, though a recent dampening may point to sluggish growth later in the year. Meanwhile, interest rates should rise slightly, enough so that higher net interest margins (NIM) will give banks some wiggle room to better offset regulatory capital and liquidity requirements. Also, despite higher long-term rates, the residential mortgage business will likely grow as housing starts are expected to jump to meet continuing demand. Nonbank lenders should increase their participation in this environment. While both residential and commercial real estate will profit from this new construction and diversifying lending market, signs of mellowing could emerge as lenders proceed cautiously in a regulated market that will extend to nonbank participants. Industry performance in the past several years reflects stability and resilience. 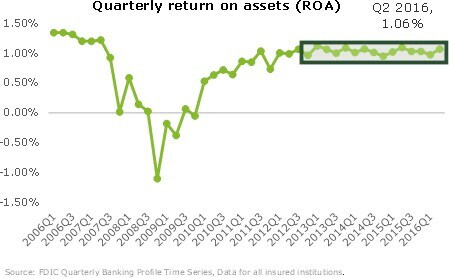 The banking system’s return on assets (Figure 1) remains in a narrow band, as banks offset weaker NIM with excellent asset quality and some efficiency gains. Higher interest rates will mean customer and business growth that includes prudently managing increased lending. Higher wage growth, rising household incomes, and consumer confidence should bring new retail and small business lending opportunities, especially as NIMs rise due to rate hikes. However, retail deposit costs may rise faster than expected, as liquidity coverage ratio requirements place a premium on high-quality stable funding. Transforming operations will entail carefully managing tradeoffs between remaining competitive and streamlining costs. While a new political regime puts policy uncertainty top of mind, banks are expected to continue moving from traditional levers of cost management and to shift operating models, such as the use of central servicing organizations to drive simplification and automation. A complex execution list of regulations and risk is now clouded by uncertainty about the coming regulatory regime. With emerging clarity on the new administration’s regulatory posture, banks may reexamine strategies. Nevertheless, culture and conduct risk will continue to be major agenda items for boards and executive management. Regulatory backlash could force reviews of front-line staff goals and incentives, particularly those related to sales practices and cross-selling, as well as executive accountability. Refining the customer experience will be the main driver for technology that drives core transformation, digitization, and automation. As technology upgrade cycles continue to shorten, banks may finally demonstrate a willingness to retire legacy systems for cloud-based platforms, many of which operate on subscription models. Despite expected new developments regarding the DOL rule, banks will likely continue to optimize their wealth management business and operating models. Assets managed by robo advisors are likely to continue increasing at a fast clip, as banks, insurance companies, and traditional wealth managers embrace the technology. The capital markets revenue pool has been under persistent pressure, spurring banks and broker dealers to eliminate trading desks, cut back-office staff, and ration capital. Regardless, many capital markets operating structures remain intrinsically weak. Their failure to generate returns that exceed the cost of capital naturally raises questions over sustainability. The business of US investment banks is likely to weather market volatility favorably. US investment banks should continue to outperform their European counterparts, and banks with strong trading franchises that have “stayed the course” could capitalize on a favorable environment. While potential market volatility from events (such as emerging clarity on the new administration’s policies and the Brexit transition) will likely induce client hedging activity, the M&A market could stabilize after three years of intense activity. New economic architecture should be a theme for operational transformation. Investment banks have scaled down front-office compensation, but post-front-office costs continue to constrain profitability as traditional cost management is yielding little ground. 2017 will be a year of reexamining enterprise-level economic architecture to get to true costs and returns, demanding significant investment in analytics and data management. Firms will continue paying close attention to capital and liquidity regulations. Managing capital intensity across businesses will likely persist as banks’ top priority, particularly with the inclusion of capital buffers for globally systemically important banks (G-SIBs) in the Federal Reserve's Comprehensive Capital Analysis and Review (CCAR) process. The good news is that the industry is getting better at taking new regulations in stride, developing an agility that will bear fruit going forward. Automation will likely be the technology most utilized in the near term. Automation is expected to drive capital markets efficiency through robotics applications that span across securities operations, including client screening and background checks, automated trade capture, transaction monitoring and reconciliation, client service reports, and payables and receivables. Transaction-based businesses will become the more critical of the two as banks are likely to continue moving away from capital-intensive businesses, due to regulatory pressures that put a cost burden on commercial banking operations. Customer and business growth will likely be a balancing act of product innovation and cost savings. To gain efficiencies, banks are expected to continue rationalizing customers, products, and markets, including de-risking and repricing to better balance risk and reward. On the revenue side, banks are likely to increase focus on new segments, particularly middle-market customers with global aspirations. Efficiency requirements should dominate operational transformation decisions. As returns on reengineering operations diminish, banks will likely reinvent operating models, including externalizing services that can be mutualized. Part of this operations overhauling will include digitization and robotic process automation (RPA), especially in ledger management, liquidity tracking, trade finance contract repositories, and customer onboarding processes. Regulations not likely to go away should steer banks clear from risky and capital-intensive business. The phase-in of the net stable funding ratio under Basel III will place additional management constraints on banks’ liquidity, requiring some reconfiguration of pricing arrangements with clients. Among existing regulations, know-your-customer and anti-money-laundering (KYC-AML) should remain top priorities. End-to-end digitization will likely be among the primary technology goals. The cloud is expected to be the primary tool for upgrading core transaction banking platforms, bringing cybersecurity concerns to the forefront. Banks will likely leverage big data and predictive analytics to offer tailored financing and lending solutions to corporate customers. RPA tools will be merged with cognitive intelligence across both the front- and back-office. Blockchain applications for cross-border payments and trade facilitation are likely to mature. The global drive towards faster payments has pushed US banks to join the Federal Reserve’s Faster Payments Task Force to collaborate with each other to create a linked, networked nationwide payment system. In line with this effort, many banks have joined the e-wallet market and mobile commerce is growing faster than ecommerce overall, which is growing faster than overall commerce. Digitization to improve customer experience will dominate payments growth initiatives. Faster payments will see a significant surge in 2017 as banks roll out a collaborative system while agreements and partnerships increase among banks and fintechs with the blessing of the Federal Reserve. Part of this digital transaction transformation will happen through stored “default” payments methods, which will claim a larger share of digital spend both online and through e-wallets and other types of mobile and automated transactions. Banks will likely begin to turn their payment operations inside-out to be more front-facing. Some operations that reside in the back-office will likely migrate to front-facing and collaborative systems to accommodate networked digital technology. 2017 is likely to see the introduction of a next generation PoS system that leapfrogs the need for the many merchants who haven’t done so yet to install EMV terminals. IoT-enabled payments, bots and encryption solutions will be primary technology drivers. Now that in-app and mobile wallets have become ubiquitous payment tools, their operability will likely see frequent and transformative software and maybe even hardware upgrades throughout the year. Similarly, biometrics are expected to increasingly become integrated into digital payment systems, particularly mobile, to increase security. Bots will likely increase through social media, following a trend that began with considerable fanfare in the US and China. Exchanges are consolidating, however, the policy uncertainty brought on by a new US administration may slow M&A activity in the short term. Central clearing mandates in the US and EU are pushing derivatives to central clearing houses. And the SEC approved the Consolidated Audit Trail (CAT) plan in November 2016, signaling the creation of a system that would enable regulators to monitor trading activity in the US markets in National Market System (NMS) securities. A shift to non-transactional business revenue will likely by a growth strategy. Exchanges will likely increase non-transactional revenue activity, both organically and via acquisitions. Data in particular is expected to become a strategic asset in the move to passive investing/indexation and regulatory reporting requirements. Derivative trading will remain an increasing source of exchange revenues, and the Tick-Size Pilot for small-cap companies could shift more off-exchange trading of pilot stocks onto US exchanges. Myriad challenges will require operational agility both internally and externally. 2017 will likely be the year that major US exchanges collaborate to alleviate customer concerns over trading halts and make the markets more resilient in periods of extreme volatility. Also, regulators’ openness to cloud adoption (e.g., European Union’s Markets in Financial Instruments Directive reporting and the US CAT plan) could assuage individual firms’ concerns regarding security. Compliance and regulations will focus on more security and reporting. The approval of the CAT plan will likely induce self-reporting organizations (SROs or exchanges) to focus on building enhanced reporting for equities and options. The new rules for the six too-big-to-fail US clearing houses approved in September 2016 will require them to hold minimum capital buffers and submit resolution plans. Technology in the coming year will manifest as innovation put to tests. Artificial Intelligence and machine learning could shift the industry from post-trade historical analysis to pre-trade predictive analytics, and exchanges might launch machine-learning tools to track rogue traders. The Financial Industry Regulatory Authority is expected to test this machine learning application in 2017. In addition, blockchain pilots to bring efficiencies to the post-trade manual processes will gain momentum, though mainstream adoption looks unlikely in 2017. Bank mergers and acquisitions. M&A activity may slow considerably until greater clarity about the coming regulatory landscape emerges, possibly prompting a fundamental rethink of business strategy. Even so, large national banks will likely continue strategic divestitures to hone their business footprint, shedding ancillary businesses that aren’t core to the portfolio of client services and don’t generate sufficient ROI. Large regional banks with assets in excess of $50 billion may continue making strategic acquisitions to better tackle regulatory compliance overhead. Smaller regional banks approaching $50 billion in assets will try to get comfortably above that mark to attain operational and compliance heft that systemically important financial institutions require. However most M&A activity will take place among banks with assets between $1 billion and $10 billion. Cybersecurity. While core cybersecurity threats remain the same, more sophisticated threat vectors are emerging resulting in greater impact. For example, in addition to distributed denial-of-service (DDoS) attacks, denial-of-system attacks that make enterprise-wide information systems completely inoperable are likely to increase. With cloud adoption accelerating, encryption, identity, and access management are likely to dominate the agenda. In addition, regulatory pressure is likely to increase, forcing banks to focus more on regulatory compliance rather than risk mitigation. Newer operating models that take into account appropriate risk appetite are likely to evolve, with banks relying on consortium-type approaches to share resources and capabilities. Third-party solutions, including managed services, are also likely to evolve in keeping with clients’ demands. Marketplace lending. Marketplace lenders (MPLs)—online platforms that match borrowers with lenders—will likely see some consolidation in 2017 and continue to converge with banks through partnerships, white label contracting, and even some mergers. Meanwhile, the more established MPLs are expected to gain scale while the smaller ones without strategic bank relationships could begin to disappear. Otherwise, residential mortgages will see an uptake in marketplace lending as will auto lending. Recovery and resolution planning. The simplification of legal-entity structures spanning across the globe demands alignment with contingent capital and liquidity allotments for operating entities once the holding institution begins to wind down. These arrangements are financial, legal, and operational—ranging from collateral management to the structuring of transaction booking models as certain entities cease to operate. The intensity of the recovery and resolution planning process creates implications for business flexibility. Management may now have a heightened burden to prove that changes in strategy, such as an acquisition or organic expansion into new markets, do not create new impediments for resolvability. Explore new trends in regulatory compliance in the 2017 Banking Regulatory Outlook. Get ahead of new securities regulations and trends. Read the 2017 Securities Regulatory Outlook. 2015 Banking Industry Outlook: Boosting profitability amidst new challenges.